The ETL Mark I was Japan's first digital automatic computer -- prototyped in 1952 by the Electrotechnical Laboratory using relays. It was a completely asynchronous type. 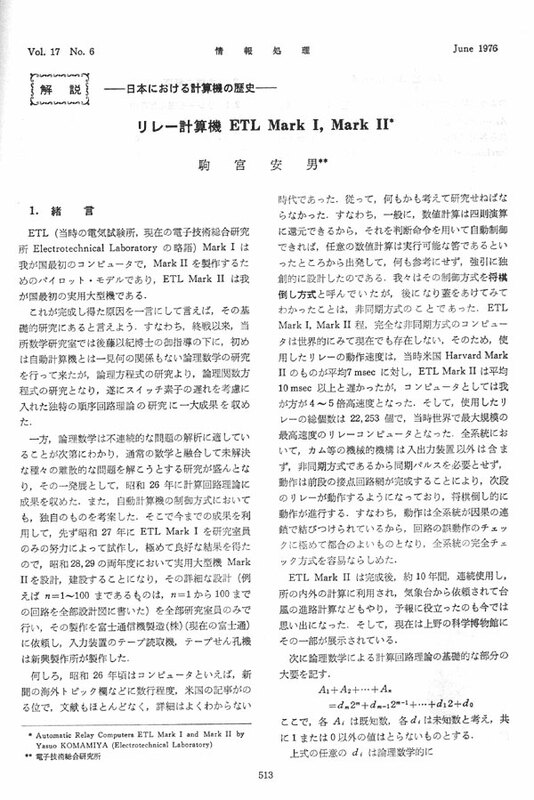 Komamiya Yasuo applied a method of solving logic function equations (based on the logical mathematics of Goto Mochinori) to the design of computation circuits, and in 1951 made use of the results, which had been integrated into a theory of electrical computation circuits. Since the reliability of vacuum tubes was poor, and transistors were still not practical, it was decided to use relays as components due to their extensive track record in equipment like automatic telephone exchanges. The ETL Mark I was prototyped in 1952 due to the hard work of the researchers, and favorable results were obtained. Due to these positive results, a practical machine called the ETL Mark II was developed based on the same theory and system.